Cafe Vamp is one of those places that seems to be perpetually full - it certainly isn't your typical Hawthorn cafe and looks like it's been transported from Brunswick Street. 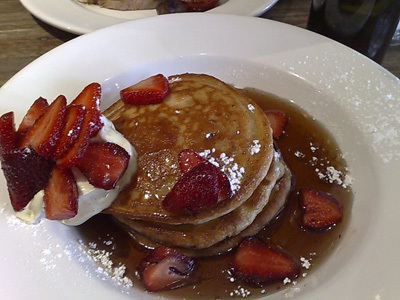 Paalo has the 3 stack of pancakes with mascarpone, strawberries and vanilla syrup. As a pancake aficionado this gets a big thumbs up. 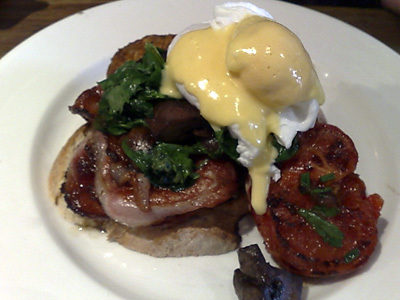 I order the Big Brekky - toasted sourdough sits underneath this pile which contains 2 small spicy pork sausages, spinach, sautéed mushrooms, bacon and grilled tomato. 2 poached eggs (not quite as soft as I prefer) and hollandaise top this dish. The coffee is also excellently made and served at the correct temperature.